Handcrafted from traditional techniques flowing back thousands of years, these glasses are handcrafted by artisans in the city of Herat, Afghanistan. Each glass is unique and slightly different. Each purchase provides dignified work opportunity to artisans in a country affected by war. In addition to a fair wage to your artisan, we provide an additional 20% of your proceeds to the non-profit Turquoise Mountain to help preserve cultural heritage in Afghanistan. Not suitable for hot teas or coffees, avoid having boiling hot liquids in the tumbler. The artisan Ghulam is one of the last glass-blowing artisans in a once thriving industry. 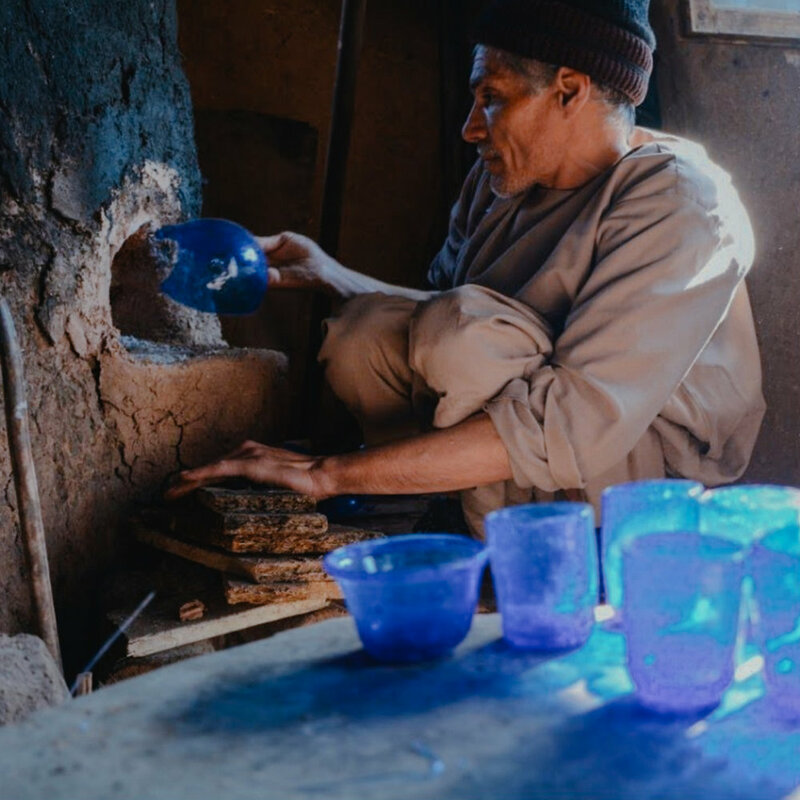 He works from a small workshop in Herat, and fires each glass individually in a mud-brick furnace. The artisan first blows sharp bursts of air through a long metal pipe to inflate the molten glass into a parison, before leaving the glass on a marvel to cool down and molded. The beautiful colors comes from a mixed glaze comprising of ‘ishkar’ and ‘river quartz’. The quartz is sourced from nearby riverbeds, while the ‘ishkar’ glaze is derived from an indigenous desert bush. Contemporary glass blowers still choose the best ishkar by tasting it; the sweeter the taste, they say, the better the quality. Learn more about our other Afghanistan craftsmanship here.